reading | Blog, Jane! Blog! 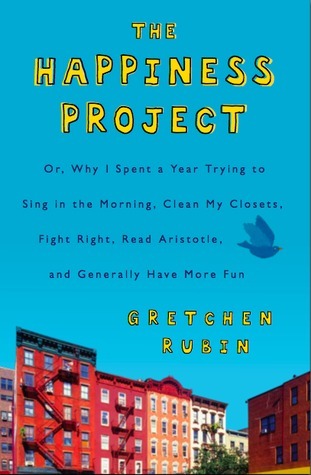 A book by Gretchen Rubin. And inspiration to some changes in my life. Funny, I have no reason to be unhappy, but know that I don’t always appreciate everything and I know that my sarcasm and nagging and complaints probably wear on some people (even outside my husband). She also addressed how we need to appreciate the seemingly sunshiny people in our lives and not be cynical about their disposition, because it is hard to always be sunshiny! Started working out. Completed 9 weeks of Couch to 5K training, running a 5K next week. (yay, me!) Taking care of myself! Fixing my lunches and planning dinners. but also giving myself some flexibility on what we eat at home. Nothing fancy, keeping it simple. Acknowledging that I don’t have a lot of time, but I can manage my priorities to take care of myself and being happy. I gave up A LOT when I was pregnant with Charlie. Trying to regain some aspects of life prior to having kids. Exercise is the big one for me, and career development is the other space I’m working on. Not caring what people think, I’m speaking up more at work, asking questions, pushing some points – for pete’s sake, I’m a business analyst. This is what I’m supposed to do! Taking a break from facebook. Not sure if that was a conscious decision or not. I’m on it, but just not every day and almost never more than once a day. So my decision with blogging, I’m keeping it. I may be using it more as a journal so that I have a record of life or as my new category reads (moments). But what I did decide about my blog was that I’m not maintaining the framework. I’m hosting it via wordpress.com instead of the host I have been using since I moved to this domain. 2 reasons, because it’s cheaper AND the last time I upgraded wordpress, I had to move and edit files manually because the script my host provided didn’t work. And then the next day a new patch was released! I do like to geek out a little, but that’s just frustrating and I lost about 3 hours doing that! So that’s it. In a nutshell. I’ll try to keep you updated when I start the re-read and what I decide to do going forward. Oh, and another thing, going to bed early… huge difference in my attitude every day. Anyway, I recommend this book. You don’t have to be unhappy to improve your happiness. Besides leaving behind “the yuck of January”, we have lots going on in February. Good things! I started reading a book! I was a slacker in 2010! Charlie is turning 1 and we are having a monkey-themed party! Oh, and the Groundhog did NOT see his shadow, so I’m hoping that truly means an early spring.